… What plant would you be??? I thought it would’ve been easy! At first I thought “Agave desmettiana variegata!” – but then reality came crashing in – I’m not that well turned out! A. desmettiana variegata is always PERFECT = beautiful striping, lovely mid- green color … and the FORM! I might have achieved that kind of pulled together-ness once or twice, but it’s not me. 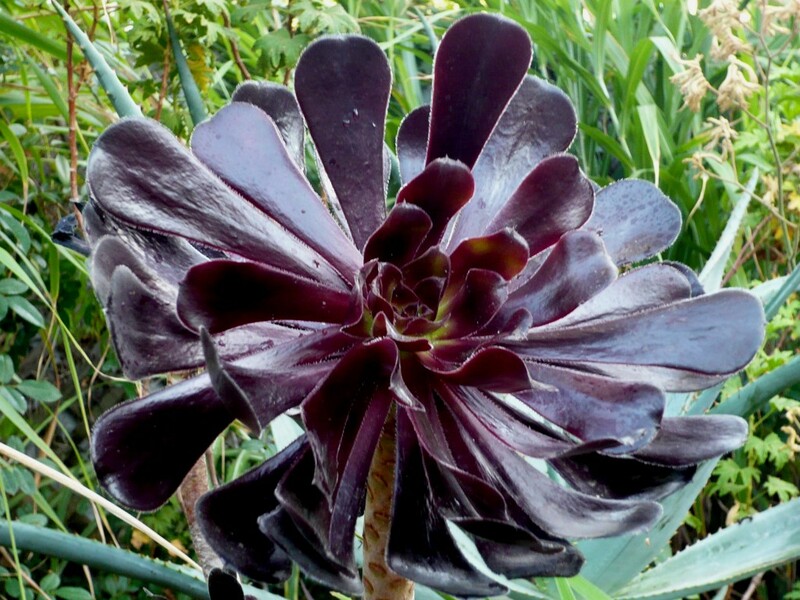 The next obvious ‘ME’ plant was an Aeonium ‘Swartzkopf’ – tough, easy to grow, dramatic, kind of comical – but also somewhat mysterious and admittedly gothic. But is that just too easy? Am I making a caricature of myself? And I’m not really mysterious AT ALL … hello! I blog my every thought! 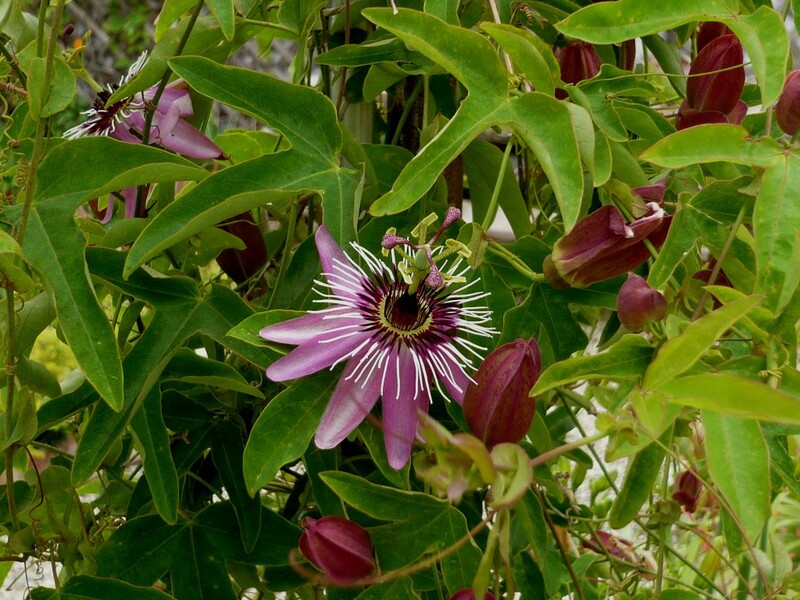 could I be a passion flower vine? I know what I’m NOT – I’m definitely not a Canna ‘Tropicanna’ – even though I sort of wish I was. Tall, slender, leggy – topped off with an eye catching flower. But you don’t even really NEED the flower because the foliage is so va-va-va- voom. 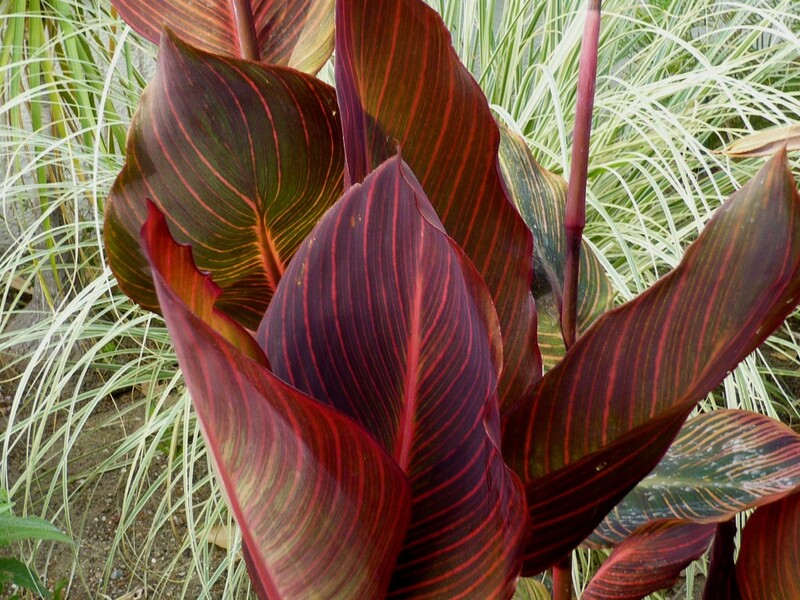 Canna ‘Tropicana’ is the plant version of Gisele Bundchen. could I be a queen? Maybe I need to go back to my agaves. There is a small one – Agave victoria-reginae … nice and round, spines at the tips of the leaves (but not scary ones – just enough to let you know she has an edge), decorative white lines on every leaf that makes her very different from the rest of an already peculiar pack… She’s a slow grower. You have to be patient with her. She likes to be in a container where everyone can see her, but she’s also really happy to play in a big raucous planting of assorted succulents. She likes being called a Queen, even though she knows she’s just a plant like all the rest. I understand her. So I guess if I HAD to choose – call me Agave ‘Queen Vicky’! So which plant would YOU be? Be honest!!! It’s fun! 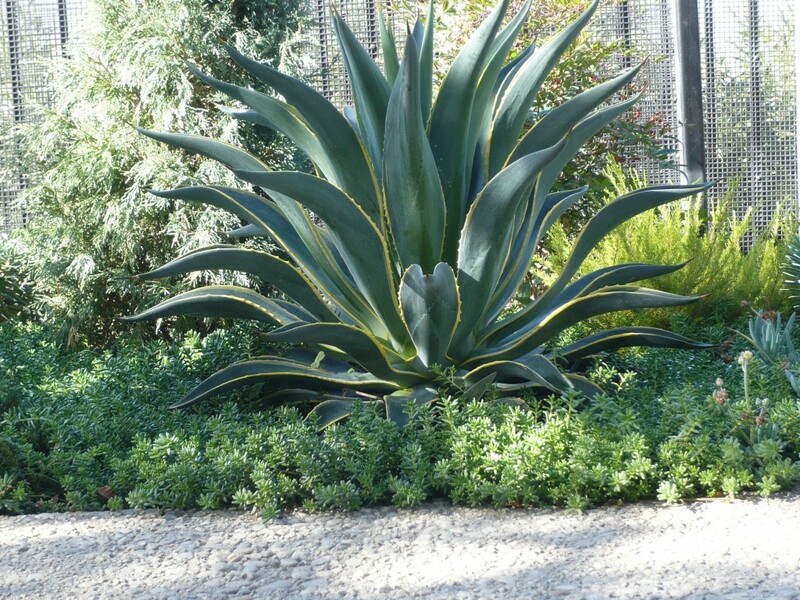 i love your plants including the agave…i think you should be her since these are longer growing and longer lasting….they are truly treasured jewels…. Hey Noel! 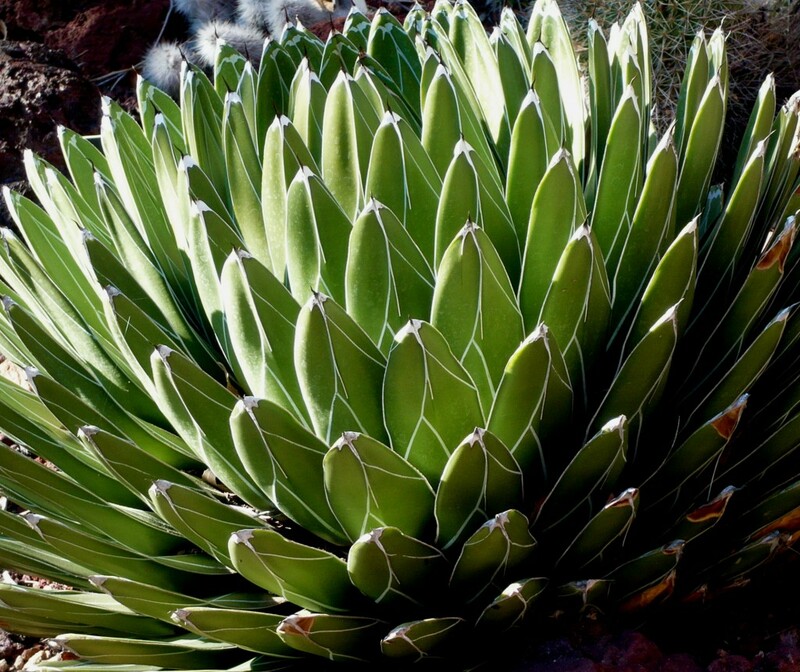 Yes – it is so hard for me to NOT be an agave!!! Maybe I am WISHING too much to be Agave victoria reginae and molding her qualities to fit mine – but that’s fair, right? And you are SO on the money – they ARE jewels! Tom – Hmmm… GREAT choice! The famous spiral aloe – grows one direction, then all the sudden it changes its mind and goes the other way! So what is that saying about you? Do you “Spin both ways?” Intriguing! YOU are mysterious! And you have great taste in plants!!! God… your agaves are making me jealous — here in Michigan we are expecting snow tomorrow, and agave have to be hauled inside every winter. But what plant would I be? Goodness… maybe Hieracium maculatum ‘Leopard’ — Which is basically a weed, but a funky quirky weed with cool spots. Hi Joseph! I have to be sheepish about our fabulous agaves – it is SUCH a luxury to be able to have them in the soil and leave them there for the winter! But I have to bow down to you, a rare and wonderful breed, an Agave Lover from the north! You have to work hard for your love, and take care of … in fact, CATER to the objects of your desire! BRAVO and KUDOS to you! And a VERY interesting choice of plant – it says ALOT about you! Hieracium is indeed a little weedy, but a more fashionable weed you could never find! I think the juxtaposition of the cheerful flowers and the drop dead gorgeous foliage tell us that you are careful about appearances, but you don’t take yourself TOO seriously – having fun is the goal! And considering that Heiracium maculatum ‘Leopard’ is not a rampant self-seeder, you know how to spread yourself around without making yourself obnoxious. I think your choice of plant means you are the kind of person people really like having as a friend! I didn’t know this was going to be a personality quiz! How FUN! I love doing things like this! I hope more people comment! You are right…it is a mini personality quiz! I’m still weighing my good and bad qualities and trying to figure out the answer. This may send me to a therapist. I wonder if there are any garden therapists? Given your analysis of what my choice reveals about my personality was so utterly complementary, I have decided it must also utterly correct, and you are extremely perceptive. If you had said anything I didn’t want to hear, I would have detect you for a fraud instantly! I wish I were a beauty queen like your agave desmettiana variegata. I think I’m more of a citrus tree– slow and steady and a little sour. (Everyone is one of those at some point after all, aren’t they)? I would have to go with the succulent welwitschia mirabilis. I don’t like to be disturbed. It is a loner, it grows in the middle of nowhere. It looks like there is a lot to it, but really most of these heaps actually consist of only two leaves, wait, I am not saying I am a heap or anything,… oh never mind. It looks like it would be as happy under the oceans as it does in the desert…(err…I have gills on my neck)? Oh and did I mention, I want to live for one or two thousand years, preferably in a nice, quite abode in the middle of the many unexploded landmines in Angola (for my own protection and solitude). Oh I am terrible at this, I was in school! Loree, I’ll be your Garden Therapist!!! Okay – I’m going to take a wild stab and give you a plant – what do you say to being Phormium ‘Apricot Queen’? Of COURSE you’d need to be a plant of exquisite form, and Apricot Queen has the most beautiful leaves that start out upright and then curve gracefully at the tips – she should be sharp, but then she beautifully curves. The variegation brightens up the shadiest corner, and the unusual, bright blooms get better as time goes on – this is one plant that truly gets better the longer she sits in the ground! Since you are such a fabulous zone-pusher, you need to be a plant that is risky in Portland! So, even though I don’t know you IRL, I’m taking the leap with Phormium ‘Apricot Queen’! Or Agave potatorum (my new obsession!)? Joseph, I am glad you understand my powers. I use them only for good. And keep me posted on your A. parryi’s overwintering! I’ll keep my fingers crossed, too! Chanchow! I LOVE that you are a citrus!!! How about my favorite – a Eureka Lemon? Slow, steady, a little sour – but a MUST in every So Cal garden and kitchen!!! And one can’t forget the amazing sweet that goes along with that lovely sour – the intoxicating scent of the blossoms! Yes – EUREKA!!! Oh, ESP – Amorphophallus INDEED!!! Leave it to YOU to choose the most uncanny, the oddest, the STRANGEST plant ever known!!! Welwitschia!!! You have CONFOUNDED me – ME, whose powers of horticultural anthropormorphic divination are almost legendary! You are indeed a loner, but people come looking for you, because you can’t help but entice! One step into your world, and the landscape around you becomes surreal; you are a mediator between this mundane world and the world you, the Welwitschia hints of – a surreal, clock-melting wonderland hiding in between the grains of sand underneath the pile of odd starfish leaves. You SHOULD live for two thousand years!!! Starting now! I’m in kind of a bad mood right now so I probably shouldn’t do this… LOL… OK maybe I need that sense of humor. I’ll say Selinicereus. I’m not sure of the species exactly. Long, rangy and kind of funny-looking most of the time. I get dressed up maybe one night a year and people are suddenly astounded. I strike strangers as unfriendly but fairly harmless. That’s only sort of true; I am harmless if left alone, but I have tiny thorns that sneak under your skin and will irritate the crap out you and I can be really difficult, especially if you want me to grow a certain, cultivated-looking way. I do my own damn thing. I’m not high-maintenance and don’t like to be coddled, but I don’t bloom readily, either. I’m not popular, but the people who do like me think I’m totally fabulous. I like to climb tree trunks and sometimes walls, and might look good in a hanging basket. No. I did mean selinecereus. Germi, dear Germi, have a wonderful holiday season, and keep posting! What a great concept….and I love the plants you picked. Why am I not surprised that most of them are plants I’d pick for myself? Especially the Queen Vicky?? You and I are SO soul sisters!!! However, you have such a way with words….just amazing – really amazing. Thanks for a good morning laugh!! I’m going a different route – an heirloom rose, not as fussy and high-maintenance as everyone thinks. Classic, hardy, yet somewhat showy. Climbing Cecile Brunner, maybe? Oh Ivette! I LOVE This concept. I ask myself the same question and have the same crazy internal conversations as I personify plants and compare my traits. I’m trolling your blog and having a blast. xoxo.